Tomorrow our friend, Maryann Wakefield, will be signing her new novel, A GENTLE SUN COMING, at Barnes & Noble in Springfield from 1:00 – 3:00 p.m. The store is at the corner of Glenstone and Battlefield. If you don’t know Maryann, here is a bit more about her. She had a long and successful career as an elementary teacher and principal. She also worked in administration for the Springfield Public Schools district and taught courses at Drury University. These days she has more time to spend with her other passion, writing fiction inspired by a lifetime of observations, experiences, dreams and what-ifs. Among her affiliations, she sits on the board of Writers Hall of Fame, an organization that recognizes outstanding writers and promotes student writing, including a scholarship program for college bound future writers. If you’re out and about tomorrow, I hope you’ll drop by Maryann’s signing to meet her and maybe buy a copy of her book. She’ll be glad to sign it for you. Our long time friend Maryann Wakefield has just had her novel published. A GENTLE SUN COMING, was briefly out in e-book two year ago but her publisher went out of business and left her (and other authors) hanging. Maryann’s agent, Jeanie Loiacono, found a new publisher so after a time out to get reorganized, the novel is out at last in print and e-book editions. Just discovered that a good friend is taking the same Caribbean cruise we are. Larry and Maryann Wakefield and we are scheduled on a Holland America ship five days from now and it turns out that Susan Hutchens from Colorado is taking the same cruise with her family. There are thousands of people on those gigantic boats but I’m sure we’ll meet a lot and I look forward to our visits. Susan is an elementary teacher and active in the Colorado Reading Association. Two years ago she was chair of CCIRA and invited me to present at the conference, which is an old favorite of mine. I’ll remind you later but during the week onboard and the week after I’ll have little or no Internet so I’ll not be posting. Time for some serious goo foffing! On May 12, Maryann Wakefield interrupted her life, not to mention her writing career, when she tripped in her driveway and suffered head injuries. Fighting back to regain her life where it left off has been a long, hard struggle. Therapy continues but as we all know, writers don’t quit. At this time, three months after her accident, it gives me great pleasure to share Maryann’s announcement that she’s back at work on her second book, A RAGING STORM COMING, which takes up where A GENTLE SUN COMING left off. Two days ago she gave me a sneak preview of what’s ahead, and I’m impressed. It’s going to be another good read. Congratulations, Maryann. Thanks for the courage and for being such a role model. Thanks, Larry, for being the kind of mate she had to have throughout the worst of the ordeal and for being with her now to help in every way she needs. It’s a privilege to know you both. Maryann Wakefield went home yeserday to continue her recovery from her fall in the driveway on May 12. Needless to say, we’re all feeling joyful. 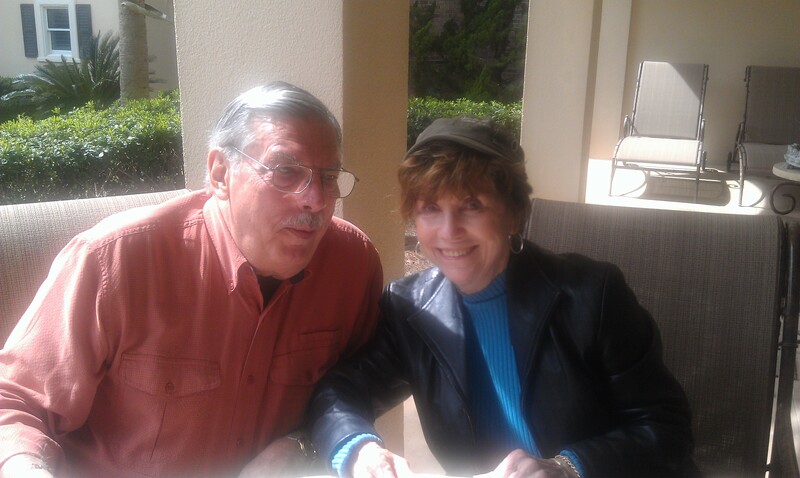 Until she can tell you herself, thanks from Maryann and Larry for the many, many good wishes you’ve sent their way!